P.U.R.S.E. (Partnering Under Real Situations Everyday) Foundation is hosting a FunShop…LearnShop…WorkShop focusing on Teen Dating Violence. 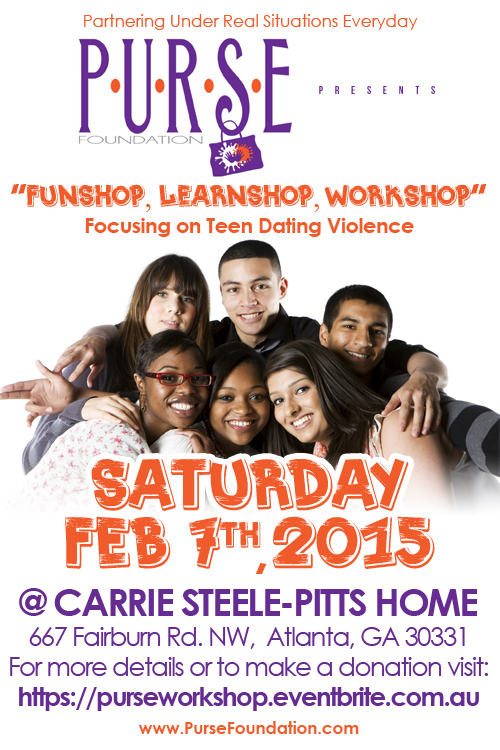 The workshop will be held at the Carrie Steele-Pitts Home (CSPH) located in Atlanta, GA; consisting of a group of 30 teens, male and female. The CSPH chartered in 1888, their mission is to maintain a family environment that fosters the physical, educational, social-emotional and spiritual development of each child and young adult from the age of 12 to 24. P.U.R.S.E. Foundation will provide the teens and young adults at Carrie Steele-Pitts Home breakfast, lunch, informative sessions that will afford them the opportunity to learn life skills during the workshop. In addition, they will receive a host of trinkets and gifts. Female teens will also receive a P.U.R.S.E. Foundation love affirmation scarf and male teens will receive a tie and skill training class on how to tie a tie. Both of these gifts convey the message that if anyone is going to wrap anything around you, let it be filled with warmth and love! Support is still needed to ensure a successful workshop! Please consider having a hand in this workshop by making a donation to sponsor a teen for any monetary amount at www.pursefoundation.com under the Event tab. The teens at this facility are also in need of gently used coats, clothes and shoes, if you would like to provide any of these items please contact erikalee@pursefoundation.com. We are asking that any and all donations be kindly remitted no later than Friday, January 16, 2015. Speaking up for the weak, I will do! Being a voice against violence, I will be! Living my life with purpose, I am! – Erika Lee, P.U.R.S.E. Founder.